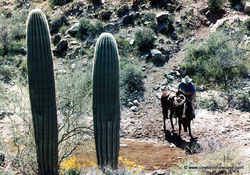 "I'm over 81 now and have spent most of them years ahorseback on central Arizona ranges - -- - since about 1949. So I reckon I'll be pesterin' you all for awhile now with the little I can remember about some interesting and exciting times . . .I left The DK Ranch when they closed the books on that historic 1800's ranch that covered about 190 sections including the Sycamore Canyon that Zane Grey wrote about in his book, "Thirty Thousand On The Hoof. " Now that I am getting so ancient I have turned to only writing about my true adventures there. The DK brand finally became registered along about 1897. It was derived from the names of the two men who were involved in starting up the ranch. Drew and Kelsey.. The real interesting part of this story is that the brand was DK (their initials) including a Slash down from the tail of the K ...... The slash represented the wild and crooked narrow trail that took the cattle from the winter country up to the Flagstaff mountainous area for summer grass. It always was a rough dangerous trip going from elevations of 2500 feet up to almost 7,000 feet. Driving about a thousand head of wild steers to their summer grazing grounds. Even more cattle in the early 1900s because then the ranch ran over twenty thousand head. So when branding the new steers in the spring, with the DK slash - - - -sometimes ornery cowhands would let the hot branding iron slide idly down the steers hip ..... finishing the slash a little too long and with a crooked line to look like this trail called the Mooney Trail. I've known many old timers and like to write about my days riding with them. Like Ben, Charlie Dye, Joe Beeler, Joe Robinson, Cleve Cox. . . .I could go on . . Altho I'm writing a memoir about my 60+ yrs cowboyin' around Arizona, I am obliged to give some of these old punchers some credit too!" Can’t say exactly when I met old Ben. He’d been around Arizona for a long time before I came to the range he finally called home. To say he was different would be an understatement. He belonged to a time long ago. A survivor of the 1800s you might say, old Ben was now as time worn and rickety as his cabin, his clothes, his gear, and his livestock. Still, he carried on, impervious to the now changing fifties. Rumors whirled around him, like the dust devils that frequently made small tornados in this high chaparral. Stories painted him as an outlaw trying to elude his past. It was said that he was once a horse thief, trailing stolen Arizona horses down to Mexico to sell, then stealing horses across the border to bring back up into Arizona, working always alone except for his mean mongrel of a dog, and a horse or two. This outlaw rep was only enhanced by the ancient .44 caliber pistol he always wore on his hip, tied down, gunfighter style. 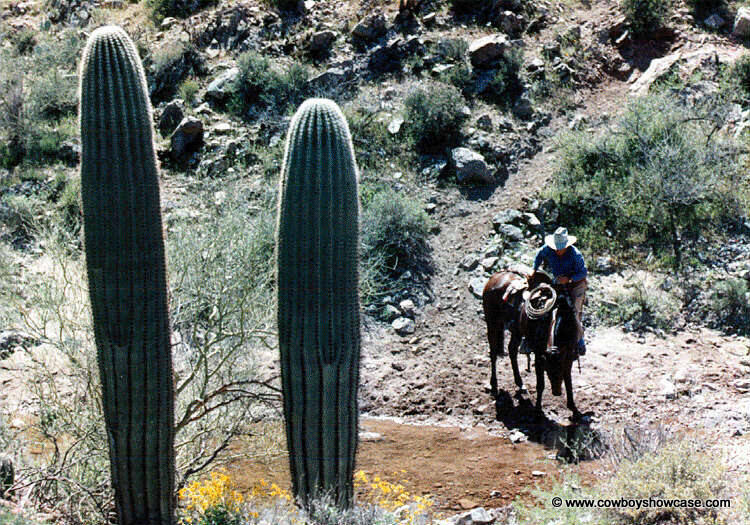 This was not all that uncommon around 1950 on Arizona rangelands. It was also said that someone might be pursuing Ben. An old score to be settled, or a wrong to be righted, with that .44 in play! The biggest tale about him was that he must have some cash, and gold hid out somewhere near his little cabin at the pass since he never was known to spend much money. Always living like the hermit he was, without any hint of modern conveniences. After I became a cowhand friend of his, I dismissed all the rumors. Time passed as we frequently met out on the range and rode together. I helped him often with his cattle and fences so he came to like and trust me. One day our friendship must have prompted him to show me something else he always carried. Like his holstered pistol, Ben was never without this good luck charm, as he called it. To my surprise, out of his bib-overall pocket he produced a shiny twenty dollar gold coin! I quickly dismissed my thoughts of any of those past rumors … Still …His cattle, a mere 60 head, had a permit to run with the hundreds of ours on the Windmill Ranch winter range. I say, “ours” because cowboys really ride and work for a ranch like it was their own. “Ridin’ for the Brand” we called it. A boss was only a tolerated foreman in charge of making plans while we all worked together. Disagreements of the fightin’ sort were always handled at a ”Kangaroo Court”. Any outcome was settled with a vote, and if a punishment was necessary it was “Chapping”. The offending culprit was obliged to “take his chapping like a man”. Be it four or more swats, by each of us, with our chaps. As a footnote here, Chaps are those leather leggings we wore to protect us from the brush. Much needed while charging hell-bent after cattle thru the needle, and spike like growth of Mesquite, Cat-claw, Manzanita, other cactus like obstructions. Chaps, from the Spanish word Chapperos meaning leather pants, pronounced just “shhaps”. Of course we would invite him to dine with us, and he always politely accepted. We’d eat at the main house, but we all slept in the bunkhouse. This dilapidated bunkhouse was located out past the barn about fifty yards. That durn shack kept us busy eradicating the scorpions, and centipedes that always visited us there and the outhouse behind it. Willy Fay, the wife of our only married hand, was hired to cook for all of us. She was not always pleased with any surprise guests, especially Ben in his raggedy unkempt attire plus packing a pistol to the table. Ben wore dingy red long johns all year long (Maybe always the same ones), covered by an old shirt and Levi jacket in the cool months. No shirt over the long johns when it was hot. It worked out very well because it was cool that way in the summer. With the breezes blowing across all those little holes in the long johns made a cool evaporating effect. Along with his worn out bib-overalls, well, it all just didn’t fit proper at Willy Fay’s dinner table. We ate, and talked a lively and fun conversation. Willy Fay didn’t allow any smoking in her home. We’d go outside this main house and sit on the sparse lawn to roll a smoke from a little Bull Durham tobacco sack carried in our shirt pocket. Others just took a chaw from a hunk of tobacco they carried. That lawn, where we relaxed that day, was once the scene of a shootout, and the death of a cowhand. It was a day like this back during the thirties. The same circumstances, however an argument arose between the family man that lived in the house, and one of the six-gun packing punchers on the lawn. After many heated words were exchanged the man that lived in the house said, “I’m gonna kill you, you s.o.b.” and rushed into the house supposedly get his shotgun. When he rushed back out onto the porch he was shot! At the self-defense trial there was some doubt that the dead man came out with a loaded, and/or aimed weapon. The jury ruled self-defense. For months after, there were signs everywhere on the Windmill Ranch grazing land that said, “Eat DK Beef”! Ben was always interesting, and entertaining, but always asking favors of us younger hands. We couldn’t deny him anything, because he did need some muscle assistance at times. We all were taught when young to respect our elders no matter how strange they acted, or appeared. So in the pursuit of our daily circles, riding to count, check, or doctor our cattle, we would sometimes come upon Ben doing the same. I enjoyed meeting up with Ben for a friendly talk about our work, the weather, and future plans for a shared roundup. Come spring we would take the Windmill cattle north to summer grazing, while Ben stayed in the hot dry climes of this valley. Ben rode with us on every spring roundup to gather his cattle with ours, cut ‘em out, and take them back to his headquarters in the pass. Sometimes I would help him drive them all back to his ranch. Ben’s homestead was as rustic as himself. The corrals, and barn were sturdy and usable but showed age as Ben did. There he had slowly built everything by himself. A little two-room cabin was home to Ben. A dug well provided pure drinking water in those unpopulated days. Candles and oil lamps were all the light you needed because when arising at daylight every day you don’t stay up very late the night before. One room served as kitchen and for dining. He ate at a wooden table he had made himself, set close to a wood fired cook stove. The sort you now may only see in western movies. You could always watch the approach to his cabin from his window over that table. Could maybe Ben have faced it that-a-way on purpose? The only other room was his small bedroom with only a closet, bureau, and small bed. It was sorta crowded up with a trunk and small storage boxes, too. I soon was to learn that Ben had plenty to do when at home. Always much to repair, and keep up on a one-man ranch. Ben did have another chore that kept him busy at home for years…There at his ranch Ben had to create his own way of getting up to some summer grass. His cabin in the pass was surrounded by about seventy acres of overgrazed parched dusty landscape. Water there was a dug well that never went dry. This acreage was nearly entirely surrounded by high rocky, jagged formations of red-rock cliffs which caught and stored internally every drop of rain selfishly allotted to this area. This well was continually supplied by water slowly seeping into it from those silent red-rock sentinels. At the north and south ends of the property these mountains came closely together leaving only about a fiftyyard passage for the roadway to Sedona another twenty or so miles. This gateway was called Boynton Pass. A seldom traveled public thoroughfare thru Ben’s land. Ben was a wily old codger, and he and his cattle were not to be totally trapped on just these parched acres for the entire summer… Ben had a way out. Out and Up! That is. Not known to many people, and not spoke of by those who did know, was a trail Ben had built over his many years there. A trail only fit for cougars, and mountain sheep. A trail only sparingly used by deer after Ben had completed it. A trail so dangerous no person would dare transgress its steep, rocky, twisting path entirely aboard a horse - - - but Ben rode, as he was too old to walk! Ben did have a couple of good horses, and one little pack mule. I’ll bet that little burro-like mule made many trips building and working that trail with Ben getting off many times to cast away stones, and fix washouts every Spring, and Fall. The trail went up at about a sixty degree crooked diagonal, a long unnoticeable scar that almost ran the entire length of this broad mountain. On and on, and up, and up…. God only knows how he must have toiled there, all alone and dead if he would have fallen. The threatening mountain loomed above his cabin to taunt, and tantalize him daily. Calling him to his constant challenge to reach the top of this grassy plateau. After a few years he completed the trail to the mountain top. He found plenty of additional grass growing there, and soon continually improved these large unclaimed meadows with seed. We can only imagine how long all this took. Daily he had to painstakingly coax his hungry cattle in small groups of two, three, or four to accept this upward, crooked, grass pocked, hay strewn journey. Monthly the trail must be repaired, and re-repaired... He was a man with extreme patience. … Could it be he needed a hide-out? Perhaps attaining grass was not his only goal? My only terrifying trip up that trail, on a nervous horse I foolishly thought could go anywhere, was even more precarious on the way down. I walked, and led him most the way down! That was the only time Ben ever let me accompany him up that secret route. It was breathtaking in more ways than you would imagine. That nervous trip up and down would even scare the horns off a Mountain Sheep. All the way ascending was an awesome view of the valley to the south 2,000 feet below, and the jagged boundaries of the Mongollon Rim rising up to the north another 1,500 foot of elevation. The trail topped out and broadened, thankfully. Off to the left was the remnants of an old Fresno, a steel scraper contrivance pulled behind a horse to plow and gather up dirt to dump a short distance away. Now a real handy item to scratch out a small catch basin to catch the run-off rain waters. Ben had dismantled this piece of farm equipment and painstakingly packed it, part by part, up that mountain to be reassembled up there for water. All this for what? Cows?…. Maybe to hide, or bury something precious? Mostly he often used the scraper to take silt out of a small crater, making a place where rain water would run, and gather at a low spot in those red rocks. There it would contain water like soup in a bowl, for the cattle grazing up there. Much better than traversing that harrowing trip every two days or so for a much needed drink. The summer rains, called monsoons, would faithfully replenish this man-made water hole just about every summer month. Then in early Fall Ben would dismantle his pole and limb blockade at the top narrowest part of the trail, and his cattle would eagerly descend. They knew instinctively that now, around September, the slow growth of summer grass would, finally, be more plentiful down on the winter range below. So the years passed like this for Ben. He certainly wasn’t getting any richer, or younger. If he really had any gold, and cash it surely must be plenty and hidden well. Our winter rides together were not that numerous. Mostly I visited a-horseback, and dropped in to see if he was at home at his ranch in the pass. When I was ridin’ fence in the springtime, getting ready for the spring round up, I would repair Ben’s home pasture fence, too. It was also part of our North boundary line. I’d call out to him or see him around his cabin. We’d visit and chat for a while, and I’d tell Ben the dates that we’d be gathering our cattle around his location. It was customary for him to ride with us then, and he enjoyed it. Sometimes, his horses and pickup were there but he was nowhere in sight. I’d call out to him without answers. Then I knew he was up on that mountain doing something . . . ? One day at spring roundup time, as we neared Ben’s range with the herd we had gathered that morning, I peeled off to the East to search for Ben. I found him near his home place with a few of his cattle, and lots of our steers he had rounded up. Together, we trailed them back over to the moving herd with the DK cowhands. It would be much easier, later, to cull out Ben’s cattle. Along the way I noticed Ben was riding in a strange and weaving manner. His horse was sometimes just meandering aimlessly and I had to call out to him. He was like a man dozing in the saddle. Soon our cattle sighted the others, and moved easily into the passing herd. We were heading to Black Tank where there was large water hole, a windmill, and a section (640 acres) of pasture to hold the cattle several days before we drove them the up the Mooney Trail to the summer country. Black Tank was our best location to hold, graze, and water almost 800 or more cattle. There was a large windmill there that pulled water up from 1750 feet. It had a fan that was over twenty-five feet. After ten days we still had not gathered the 500-600 steers to make the first drive. It was around two in the afternoon and the herd moved lazily along. Time spent like this you just rode along thinking or talking to any close rider about any darn thing…But, today, I was riding close to Ben, and having my boss pay close attention, too. Ben was getting worse off, and at times we rode up close alongside to straighten him up in the saddle. Ben made it to our roundup camp at Black Tank with our help. We used our bedrolls to make him a comfortable place to lie down and rest in the shade of the very large, thirty foot fan windmill. It was pulling water from 1750 feet down! The creaking soothed him into a nap after lunch/dinner. While he slept we unsaddled his horse, and turned him out with our remuda of now only 50 of our best horses for the roundup. It was decided that I would take Ben back home in my pickup truck when he awoke. I loaded his saddle, and bridle into the back of my truck, and soon Ben was awake, and cussing us as usual. Even now, as ill as he was, he said, in his comical manner, “You Cow-Disturbers will be the end of me, yet!” We promised him somebody would lead his horse back home. His cattle, after we cut ‘em away from the herd would graze their way back to familiar territory. We would be gathering one more day, and then leaving on the drive up the Mooney Trail. He thanked everyone as we drove away. He smiled at me, and said, ‘‘Hell yes, George, I just run out to the well and get me some!” That was probably the last words Ben spoke to anyone, except maybe a cuss or two at life, and a prayer to his God that night. We all heard the sad news together, when arriving back to the valley the following week to search for more steers. Just another cowhand “bit the dust” with not much ceremony, we thought. We soon found out Ben had a secretive group awaiting his demise! I sometimes took a different road to the town of Sedona. It was a little longer by time, and mile, but I occasionally visited with Ben that way thru the pass. So a week or so later just to remember my friendship with Ben, I drove that way. Immediately I noticed something was amiss around there. The cabin door was wide open, as were some of the corral gates. Driving over to the homesite for a look-see, I noticed chickens were scattered everywhere. Any other livestock seemed all gone. Ben did have one relative that lived a long ways off, but he or she must have only visited here to make arrangements and to see what Ben may have left. I looked into the cabin and it was a jumbled mess. Everything was strewn about like a tornado had hit the place! It was a total wreck, and a shame to see what, I supposed, looters and thieves had made of somebody's home! Even all the walls were covered with chopped out holes! I left, and reported this to the Sheriff when I got to town! He told me it was much more than just looters that were attacking that place. It seemed the little hints, and rumors of Ben’s possible hidden money and gold are now taken very, very seriously. Arizona has many tales of old treasures still not retrieved by the multitudes of seekers that continually arrive with books, maps, letters, and stories of Treasure! The searchers carry all the tools of the goldbugs.. Shovel, axes, picks, and too many varieties of electronic metal/gold detectors. Often when riding in remote canyons I would often come upon these forlorn, lost, broken and disheveled folks. Only wanting directions to water, and a way back to town. It helps to have a pistol when meeting some of these desperate types. Others are well prepared, and good at their quest which is mostly futile. Of course you know about the Lost Dutchman Mine, The Rogers Lake stage robbery cash, Casner’s gold on Round Mountain, the melted-down gold bell from a Spanish Monastery somewhere in a remote area of Sycamore Canyon. Well for a time Ben’s treasure became very popular. So easy to search for, too! It was only 20 miles from town, and all the roads were good. They came by the dozens or more. By late summer the Monsoon rains had done their annual damage to Ben’s unknown and now unreadable trail. Also many, many visitors had done their damage to Ben’s lonesome homestead. The vandals searching for Ben’s savings were never to be made aware of the mountain path of a man’s lifetime of toil. Most of us who personally knew Ben did not believe these rumors of hidden anything. I was the only one privileged to see the gold coin, the entire trail, and the Fresno so tediously hauled up that mountain. I saw the top of that plateau. A place that could keep many secrets forever! I can’t remember when the vandals and curious treasure seekers diminished, and finally quit looking. Maybe it took most of that year before they gave up. Ben’s cabin was literally leveled to the ground. As was his barn, and corrals. Everything Ben had was piece by broken piece, taken apart to nothingness. His years of labor just disappeared into the dust of Arizona. There was never a report of a success in finding old Ben’s treasures! My 25-year old life was already filled with more demanding adventures. There were other thrills awaiting on my horizons. There are still bronco horses to be tamed, wild cattle to be hunted down, tracked, roped, and brought to market - - - and all them town girls to go dance with, and maybe marry and have a family with. I just didn’t have time now for a treasure hunt on an old saddlepard’s property! Altho, sometimes, I still vision that gold coin in Ben’s old calloused hand! Now it is over 55 years later, and I am over 80 years old. Even my horses are too old, and not surefooted as the ones I once had. None of us have the energy to climb back up that waiting mountain. I’m without the legs and muscles to walk around there. Digging, digging, digging …But, gosh! … The camping out, up there, on some warm July summer night, looking at a million Arizona stars…. Sure does intrigue me! Now, too late, I have only the desire. How about YOU? ?